Amazing vacation home at an amazing price! This vacation home is sure to be a guest “favorite.” All new and squeaky clean, this spacious property offers all the amenities of home, and more! The great room, open to the kitchen and dining area, overlooks your sparkling saltwater pool and spa, lush fairway and the chocolate mountains in the distance. Two comfy sofas surround a gas fireplace and mounted flat screen TV. A bar area with built-in wine cooler also houses the media equipment and DVD player. The open dining area comfortably seats eight and there is bar seating at the kitchen counter for casual meals or visiting with your chef … and any chef would be happy with this beautifully equipped kitchen. Not one detail has been overlooked. Whether casual, formal or outdoor dining, you will be able to set the perfect table … Thanksgiving dinner to steaks on the BBQ … all your cooking needs have been provided. This vacation home has been fully furnished with beautiful dinner and serving ware as well as quality cooking supplies. Another feature in the kitchen/dining area is the built-in desk, a perfect work space and spot to set up your laptop. Three bedrooms, a master suite, a mini suite and a guest bedroom. The spacious master suite has been furnished with a king bed with luxurious bedding, a mounted flat-screen cable TV and has direct access to the back patio. Leave the blinds open and wake up to the morning sun! The on-suite has double sinks, a soaking tub, a walk-in shower and a walk-in closet. Slightly smaller than the master suite, the mini suite has also been furnished with a king bed with luxurious bedding and a flat-screen TV. The on-suite has a single vanity, combination tub/shower and walk-in closet. The guest bedroom has been furnished with a queen bed, luxurious bedding and a mounted flat-screen cable TV. The guest bath is located just outside the door and has a single vanity combination tub/shower. Located in the guest closet is a twin size air mattress and air pump. With winter guests in mind, the owners fully furnished the back patio in the fall of 2016 with a beautiful dinning set for six and two chaise lounges. The Eastern exposure offers a perfect setting for your morning coffee and watching the desert’s magnificent sunrise. 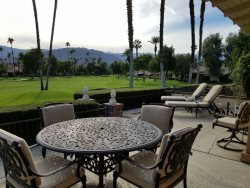 You may also enjoy the view of the golf course, part of the Palm Desert Country Club, and eighteen hole course designed by Billy Bell. Nine holes are par 34. Everything in this home is new (fall 2016), it is spotlessly clean and in tip-top maintenance. The owners have not spared time or expense in furnishing their new vacation home with all the amenities their guests might expect in a luxury property. Additional features include an indoor laundry room with utility sink, storage and new front-loading washer and dryer. The attached garage has direct access to the home and there is a home security system for guest use. The home has Wi-Fi, phones with free U.S. and Canada calling and cable TV in the living room and three bedrooms. The pool and spa are saltwater and are serviced twice weekly. A gardener maintains the desert landscaping once every two weeks. Ideally located close to shopping, dining and entertainment, easy freeway access and only moments from the Indian Wells Tennis Stadium and popular La Quinta shopping. All were very well experienced in their jobs and were overly acomadating. Trizh Zingaro, Kathy OConnor & Michelle Moran all were wonderful to work. Looking forward to working with them next year. I give Vacation Rentals of the Desert a 10 in everything. Your company is wonderful! I really appreciate the towels and coasters that you brought us on our first day. We loved the location of the house and wish it were available for next year.